The most well loved book on our huge bedtime bookcase is easy to spot. It’s a “well worn” [which is putting it politely] flap and pop up book, and most of the little characters on the paper wheels and levers have been, er, moved, by little hands. It’s a book that probably every little person [and most of us grown ups too] have read over and over, and it never gets old. It’s the Hungry Caterpillar. The boys LOVE it. There’s something about watching that little egg transform into a caterpillar and eat his way through everything insight, form into his chrysalis and then finally into a big, beautiful butterfly. We also have the Mister Seahorse book too, which was bought for us by Aunty Becki when Lyoto was born [we called him the Little Blue Seahorse when I was pregnant] but the Very Hungry Caterpillar is always the favourite. 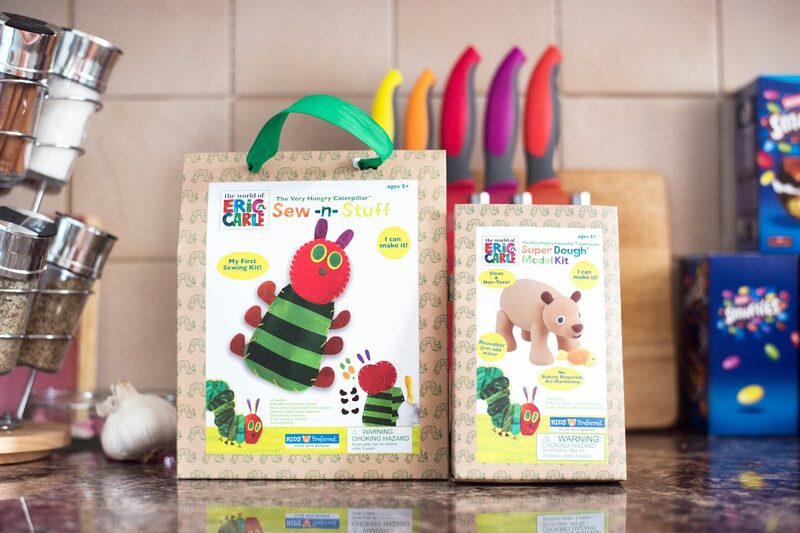 We were away at Granny and Grandad’s last week and so we took with us two little crafting sets from Eric Carle’s selection to keep us busy when we weren’t out and about in the woods or park. 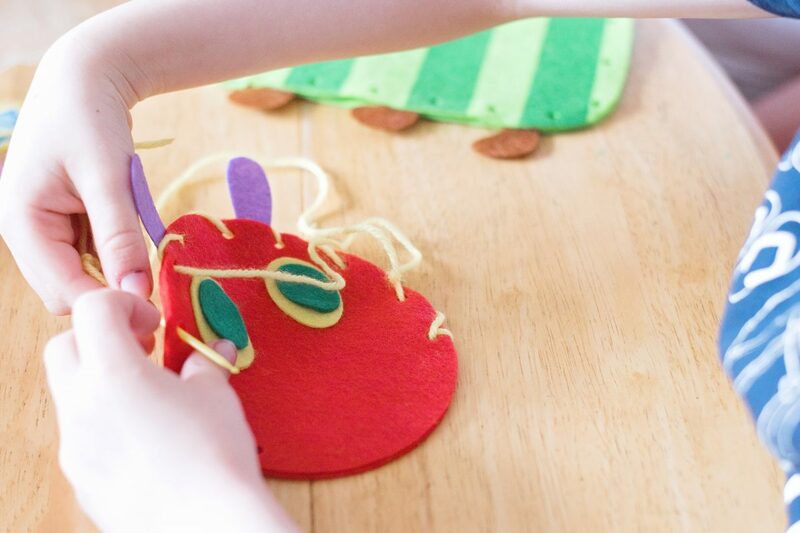 The two sets we were given to review were the Sew-n-Stuff Very Hungry Caterpillar and the Super Dough Model Kit. Jensen took the Sew-n-Stuff as he loves creating toys, and Lyoto got stuck into the Bear Modelling Clay whilst Hero snoozed. Granny and Jensen lay the pieces of the kit out and Jensen checked the instructions. It didn’t take long to sew the felt parts with the plastic needle, stick the facial features and little legs on with the double sided tape squares [Jensen AND Granny needed help to peel these off, they were quite hard to do. When it came to the stuffing we quickly realised that due to the spacing of the holes, the little puppet could only be stuffed lightly or he puckered at the edges. Also, his head didn’t connect under the chin to the body and so we tried to use a little bit of sticky tape to do this, but his head just flopped about. When we read over the instructions again and looked at the photograph on the pack, there are so many less holes on the actual caterpillar head in the pack than there are on the photographs. If there had been as many holes as on the front of the pack then we think he would have held together a little better. Jensen loved his caterpillar and was so proud of his work, but it was evident that this was a caterpillar to be gazed at and not touched, which made him quite sad as he wanted to play with his creation and it just wasn’t made for playing with. The stuffing would come out easily and his head just flopped backwards or forwards, unattached to his little body properly. Lyoto’s bear has yet to be photographed – he lost an eye and Granny is trying hard to find his eyeball. If we find it we’ll upload it this week, otherwise we might be Photoshopping an eye onto him. The set itself was fun for Lyoto to do. The clay was a lightweight kind of material that felt nothing like normal clay. There was more than enough to complete the little bear and his fishies as in the photograph, with some left over for Hero to play with. As the clay dried out on Granny and Grandad’s windowsill, it stuck together. Again, this was a fragile toy and one just for display – but the instructions were so easy to follow that Lyoto [just 5] followed the instructions completely by himself and created his bear. We would absolutely buy these for rainy days. Thank you Eric Carle for our exciting hour of crafting – we had lots of fun trying them out!